Nick Rickles does not have any MLB stats for the season. Draft: 2011, Oakland Athletics, 14th rd. November 19, 2018 C Nick Rickles assigned to Toros del Este. November 2, 2018 C Nick Rickles elected free agency. August 27, 2018 Lehigh Valley IronPigs activated C Nick Rickles from the 7-day disabled list. August 3, 2018 Lehigh Valley IronPigs placed C Nick Rickles on the 7-day disabled list. Left forearm contusion. July 12, 2018 C Nick Rickles assigned to Lehigh Valley IronPigs from Reading Fightin Phils. July 4, 2018 C Nick Rickles assigned to Reading Fightin Phils from Lehigh Valley IronPigs. February 13, 2018 C Nick Rickles assigned to Lehigh Valley IronPigs. 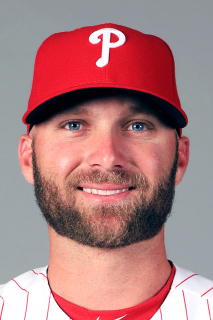 February 13, 2018 Philadelphia Phillies invited non-roster C Nick Rickles to spring training. December 21, 2017 Philadelphia Phillies signed free agent C Nick Rickles to a minor league contract. November 6, 2017 C Nick Rickles elected free agency. August 4, 2017 C Nick Rickles assigned to Lehigh Valley IronPigs from Reading Fightin Phils. May 25, 2017 Washington Nationals traded C Nick Rickles to Philadelphia Phillies. May 25, 2017 C Nick Rickles assigned to Reading Fightin Phils. May 16, 2017 C Nick Rickles assigned to Harrisburg Senators. March 29, 2017 C Nick Rickles assigned to Washington Nationals. March 12, 2016 C Nick Rickles assigned to Washington Nationals. February 8, 2016 C Nick Rickles assigned to Harrisburg Senators. February 1, 2016 Washington Nationals signed free agent C Nick Rickles to a minor league contract. October 13, 2015 Nashville Sounds released C Nick Rickles. September 2, 2015 C Nick Rickles assigned to Nashville Sounds from Midland RockHounds. August 26, 2015 Midland RockHounds placed C Nick Rickles on the 7-day disabled list. July 2, 2015 C Nick Rickles assigned to Midland RockHounds from Stockton Ports. April 8, 2015 C Nick Rickles assigned to Stockton Ports from Beloit Snappers. September 17, 2014 Beloit Snappers activated C Nick Rickles from the 7-day disabled list. April 3, 2014 Beloit Snappers placed C Nick Rickles on the 7-day disabled list. April 12, 2013 C Nick Rickles assigned to Beloit Snappers from Midland RockHounds. April 1, 2013 Nick Rickles assigned to Midland RockHounds from Beloit Snappers. March 19, 2013 C Nick Rickles assigned to Oakland Athletics. April 2, 2012 C Nick Rickles assigned to Burlington Bees from Vermont Lake Monsters. March 17, 2012 C Nick Rickles assigned to Oakland Athletics. July 3, 2011 Nick Rickles assigned to Vermont Lake Monsters from Sacramento River Cats. June 30, 2011 Nick Rickles assigned to Sacramento River Cats from AZL Athletics. June 20, 2011 Nick Rickles assigned to AZL Athletics from Oakland Athletics. June 14, 2011 Oakland Athletics signed C Nick Rickles.